A nipper board is a great asset to many people. They are used to give the most fun and exercise over the water surface. They are therefore supposed to be maintained and taken care of in the best way possible so that they get to stay for a long period of time. The care that it is given will determine its longevity. Many people are taking it seriously by going for the benefits of nipper board covers. There are several of these in the market. The choice that one makes will be dependent on his budget as well the kind of care they would love to have for it.Â They provideÂ the most basic protection to the board and will not do much other than protect it from scratches. It may not be able to give maximum coverage to the board and is only convenient for keeping it relatively protected at the point where it is kept after use. Day covers are the more appropriate kind of nipper board covers. They are primarily made of nylon or polyester and have some padding in it to protect the board from any kind of external pressure. The zip should be made of material that does not rust because should it follow that route, it may not be able to give any more help. One should also try to determine if the cover is shock proof and heat resistant. While additional qualities will definitely affect the price, these features will help it to offer better protection against heat, water, external pressure and other undesired things. Carefully check that you get nippers board cover that are well capable of accommodating your board. All the dimensions should be well watched. The shape of the nose should also be a factor in the choice. Those that have compartments provide you with the ability to store any other object that you may need on your surfing outings. 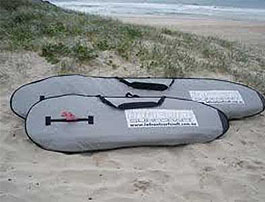 There are nippers board covers that are meant to give your board the protection that it needs when you travel. The people who handle it during your flight may not be gentle enough. The onus is on you to have it well secured so that it reaches the destination in one piece regardless of the manner in which it may be handled. It is important to go for a travel bag that has appropriate padding as this will give it the best protection. In this regard, it is important to keep your board well protected in a nippers board cover. When the board is allowed to have scratches on it, it may not last as long as it was made to do. This therefore emphasizes the need to have appropriate cover for the board whenever it is dry and not in use. the benefits in having a good cover will reveal themselves years to come when your board will still be capable of plying the waters.